Nashville's bus system trails peer cities on some measures, according to a new study. Only the areas in bright red have enough density to warrant bus service as frequent as every 10 minutes. These blue lines show the most intense routes for all trips in Nashville. By 2040, the busiest routes will look like the lines on this map. 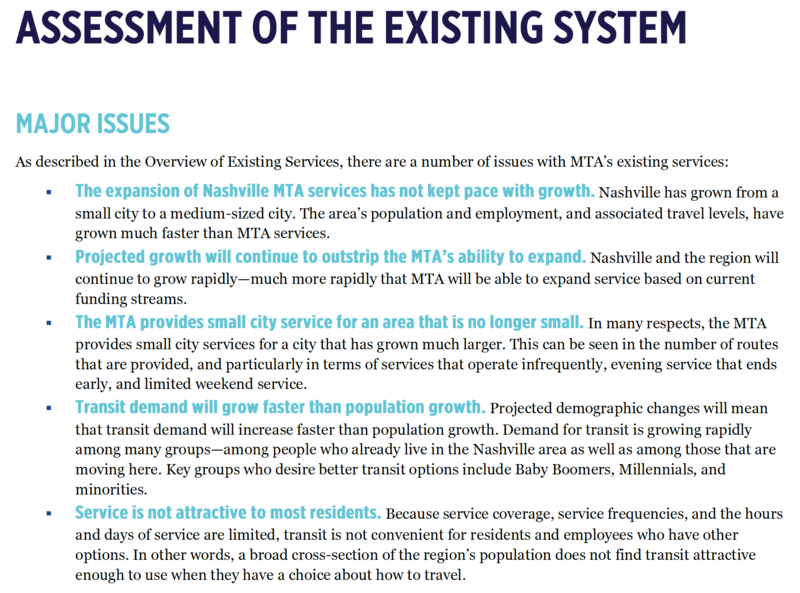 The most in-depth study of Nashville’s transit system in recent years has arrived, and it paints a detailed picture of why the city is struggling to get a growing population where they want to go. The existing MTA bus system provides “small city service for a city that isn’t small anymore,” the study found. Most of the 151-page report focuses on city buses, which rider Terrance Williamson knows well. On a recent morning, he got to his stop on time to catch a ride to his distribution job downtown, only to be surprised. So he missed it — the kind of moment that would cause some people to give up on the system. But Williamson just wants it to work better. “I think sometimes in this city — we just think immediate. We don’t think 20 to 25 years down the road,” he said. That's where the new nMotion 2015 "State of the System" report comes in, says Steve Bland, CEO for the MTA. The MTA collected thousands of complaints and ideas from riders and also compared Nashville's bus system to 21 other cities. Researchers found that buses here don’t come frequently enough. Ridership is low in a city that is especially sprawling — a big challenge for any transit agency. The study pitted Nashville against 15 “peer” cities and six especially high-performing “aspirational peers,” where significant investments have clearly placed them ahead of Nashville. Total ridership: Relatively low (9.3 million riders in Nashville in 2012). Productivity: Nashville performs above average by carrying 25.7 passengers per vehicle service hour. Cost: Nashville MTA's operating cost per bus service hour of $105 is slightly below the average costs of its current peers. Cost to the city per passenger was better than the peer average. Unique: Nashville was found to have much more expansive transit for the disabled. The good news is that Nashville’s system is pretty cost-efficient. While the study says it will take “substantially more ”funding to get better, Bland says the first step is knowing what people care about — a step that may have been missed with the failed Amp bus project. 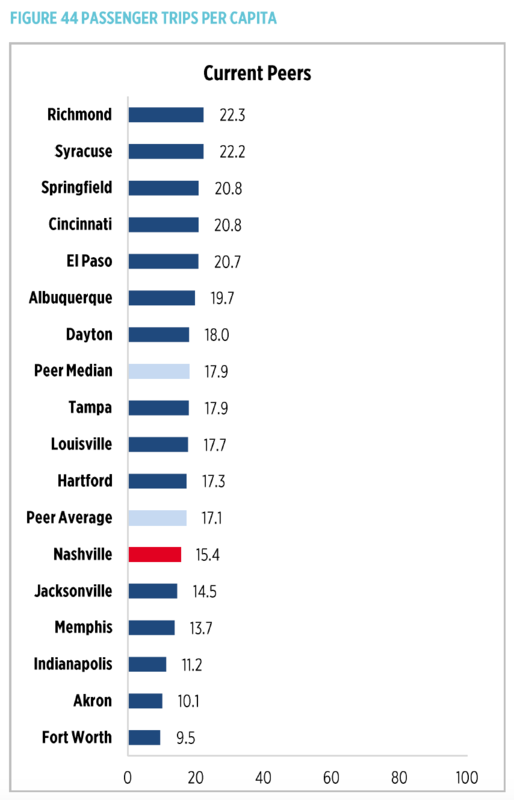 Nashville ranks behind most peer cities on transit ridership, even when considering total population. “So if we design something that doesn’t meet a customer’s definition of convenience, they flat out aren’t going to use it,” Bland said. Convenience — for McQueen Michel, of East Nashville — would be later hours, including on weekends. He’s a musician who often pulls late shifts at a restaurant downtown. That’s the big goal: getting more transit riders so that traffic doesn’t get worse. Researchers found that Nashvillians consider service frequent when a bus arrives about every 10 minutes, while MTA has typically defined “frequent” as every 30 minutes. Only nine of the city's 46 routes provide service every 15 minutes, and only during peak times. Based on population and jobs density, only a few pockets of the city can create enough demand for high-capacity transit — defined as service every 5 to 10 minutes — and that's not expected to change quickly. Of note, a huge portion of millennials in the city (73 percent) said they want to live in an area where a majority of trips are not by car. But only 6 percent said they feel they live in such a neighborhood now. Michel — and the city — just want to find the easiest way to get around. The nMotion 2015 "State of the System" report details significant challenges to improving transit in Davidson County. Approximately 33,000 passengers per weekday, 16,000 on Saturdays, and 10,000 on Sundays. Route 55 Murfreesboro Pike BRT and Route 56 Gallatin Road BRT have the highest weekday ridership, followed by the routes on Nolensville Pike, Charlotte Pike, Dickerson Road, Bordeaux and Hillsboro. Busy bus routes carry about 60 riders per hour, but some carry just 10 per hour. About 49 percent of Davidson County residents live within a quarter-mile of an MTA bus stop (that's the distance that experts say most riders are willing to walk to a bus). It’s not just any old bike lane that Nashville has paved on 11th Avenue in the quickly growing Gulch neighborhood near downtown.